The Internet of things. Fintec. Virtual and augmented reality. Total Effective Equipment Performance (TEEP). Artifical intelligence (AI). This is the language of the fourth industrial revolution – a digital revolution of machine talking to machine. It’s a revolution already under way and examples of it will be at the Marmo+Mac stone exhibition in Verona at the end of this month. Brexit has certainly thrown a spanner of instability into the UK construction market. That uncertainty has seen some projects put on hold and left some unlikely to go ahead for the foreseeable future. The stone industry has met the uncertainty with a mixed reaction in regards to its own investment in future production. Some stone companies have put their investment decisions on hold to see what demand is like after Britain separates from the European Union. If the pound weakens and prices rise, demand would be expected to fall. If we crash out of the EU and tariffs are suddenly imposed, that will undoubtedly increase prices, which would presumably create a downward pressure on demand. But that scenario has encouraged others to invest now because they fear the price of machines will rise after the UK separation from the European Union in March next year. If we crash out of the EU and World Trade Organisation default rules are applied, imported machinery from EU countries is likely to face an immediate tariff of probably 5%, even without the effect of currency fluctuations. Some also believe they will need more machinery to cope with a dwindling supply of labour – already being felt with employment at its highest level since records began in 1971 and a net loss of more than 100,000 people from the A8 (eastern European) countries in the past year, according to government figures. Another motivator is rising interest rates. The Bank of England doubled base rates to 0.5% in November last year and in August gave them another 0.25 percentage point rise to 0.75%. Mark Carney, the Governor of the Bank of England, said they could reach 1.5% in three years. That is still historically low, but it will increase the rates being charged by lenders to companies that want to borrow to buy machinery. On the other hand, there are a lot more lenders these days. The Bank of England has authorised the formation of 40 more banks since the end of the recession that followed the financial crisis of 2008 and all sorts of online lenders and crowd funders have appeared in what is collectively known as Fintec. Increased competition to lend you money helps to keep the price of borrowing down. Virtual reality and the Internet of Things can allow you to see inside a machine while it is working. And that is just one of the uses. Then there’s the sudden splurge of cryptocurrencies in the wake of Bitcoin. They have not made a great impression on wider economies yet, not least because their value fluctuates considerably more than that of traditional currencies. However, they do overcome the transaction costs usually associated with international purchases. The Las Vagas stone buying group start up called StoneCash, which has opened offices in London, Italy and Australia, is using a cryptocurrency called Phore. Further instability is added by the so-called fourth industrial revolution, Industry 4.0 (or i4.0 as it is sometimes expressed). This is a revolution of machine to machine communication and integration, where connectivity by bits and bytes are even more significant than the number of interpolated axes on your latest CNC. Some predict Industry 4.0 offers productivity gains that will at least match those of the three previous industrial revolutions (crudely: agriculture and textiles in the 18th and 19th centuries; metal bashing in the 19th and 20th centuries; digital since the 1980s) while also replacing many of the jobs currently carried out by people. At the restyled Marmo+Mac exhibition in Verona, Italy, last year the term ‘Industry 4.0’ started appearing on the stands of the machinery makers. For now Industry 4.0 tends to include a human interface, but it might not be too long before the interface is with artificial intelligence, as that would cut out what is in danger of becoming the biggest flaw in integrated manufacturing – human error… or possibly sabotage. 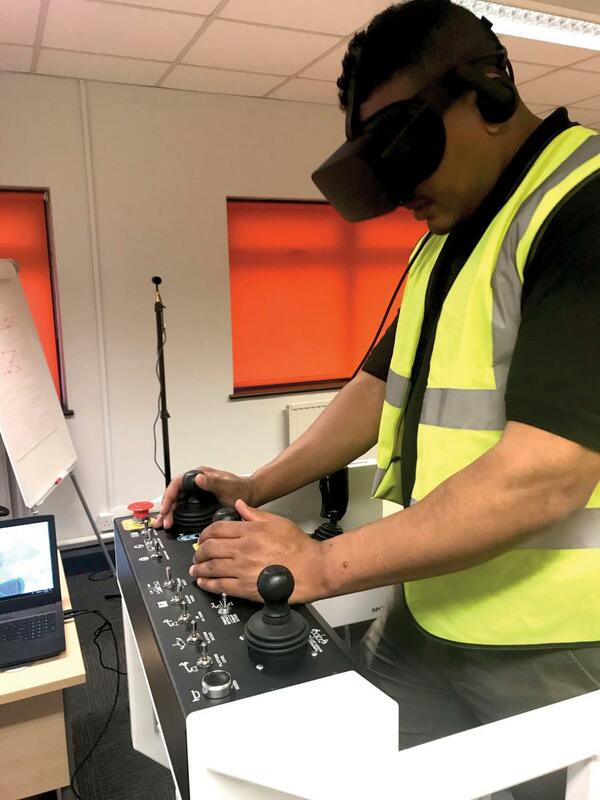 The construction industry in general has been slow to embrace new technologies and ideas but the tools of Industry 4.0 are starting to be more readily accepted – BIM (building information modelling); virtual reality to walk through as yet unbuilt developments and see inside machinery without dismantling it; autonomous drones for surveying. There are even cases of 3D printing using concrete and robots on scaffolding laying bricks. In the stone industry, digital templating and 3D scanning are supplying digital information to go on to CNC processing saws and workcentres, the files often sent over the internet from site to factory, probably using the smartphones and tablets that are now so ubiquitous they hardly even warrant a mention, even though these are the tools at the heart of the digital communication revolution of Industry 4.0. And yet in this digitally defined world – perhaps even because of it – the solid reality of natural stone has become more popular than ever. 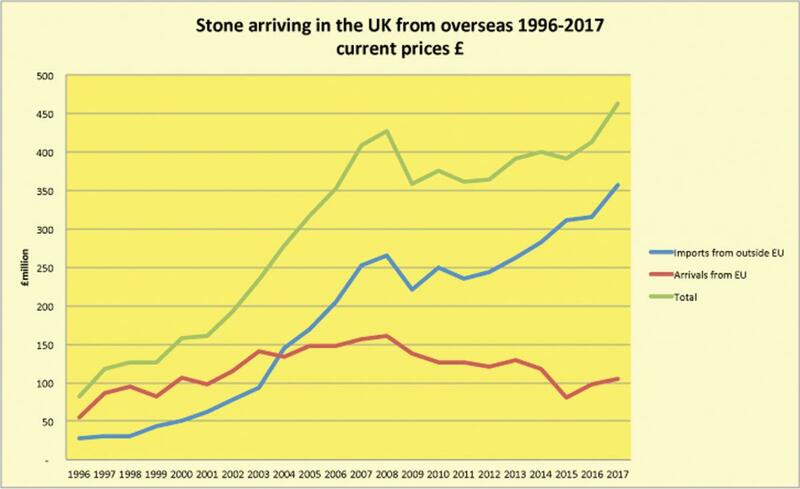 Last year the value of UK imports of natural stone topped their pre-crash peak and hit new highs (see graph - source HMRC). 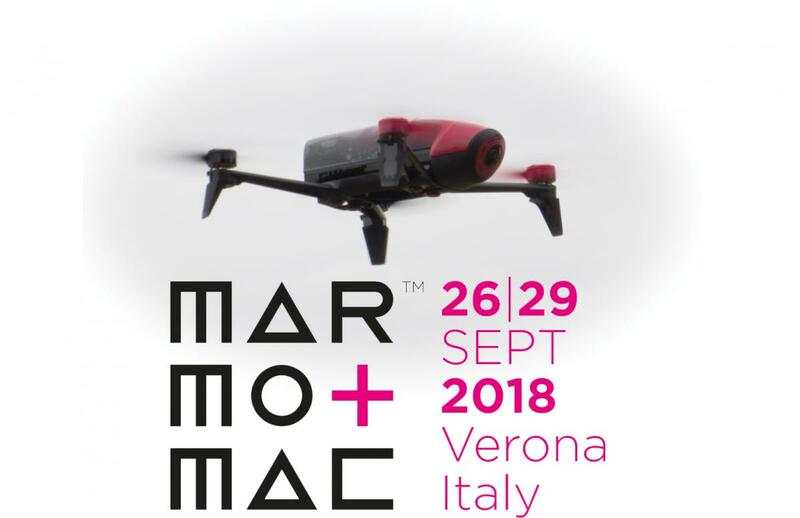 All that stone needs processing and the latest developments of the machinery to convert it into the products that appear in, on and around buildings are on show at Marmo+Mac in Verona, Italy, 26-29 September, alongside a lot of stone and stone products. Below, UK machinery suppliers tell us about the latest developments in the products they sell and what will be on show in Verona on the stands of the companies they represent. And if you can’t get to Verona, the UK has its own Natural Stone Show at ExCeL in London next year, 30 April-2 May. We will start with LPE Group because it is one of the very few British companies with a stand of its own at Marmo+Mac in Verona. LPE Group (the initials stand for Laser Products Europe) might prove post-Brexit to have made a shrewd move by choosing to source a number of American products to distribute exclusively in Europe, among them Laser Products’ digital laser templaters. Fab King is a low-tec stone fabrication solution being introduced by LPE Group along with the Rock Jockey for lifting and moving slabs quicker and more safely. Other brands LPE sells from the USA include the Slabsmith digital management system, which, along with the laser templaters, is an LPE Group contribution towards Industry 4.0. It also sells the wide range of American Omni Cubed materials handling equipment. Although sourcing products from America might turn out to have been a particularly good idea after March next year, in recent years LPE Group has been establishing a distribution network throughout Europe to sell the American products to the whole of the European market, not just Britain. Carl Sharkey and his co-Director, Simon Bradbury, have also been sending the European-made water treatment and dust suppression equipment of Turrini Claudio the other way across the Atlantic. And they sell Italian Comandulli edge polishers and CNC saws in the UK through a separate company called Comandulli UK. If the UK leaves the European Union without a beneficial trade deal and tariffs are imposed, that is an extra cost LPE Group will not want to add to products going between America and the EU. The Slabsmith offering from the LPE Group Carl came across when he first started talking to Laser Products in America about representing the digital templater in Europe. He liked the idea of Slabsmith creating a digital inventory of slabs that could be used for sales and setting up machines. But he wanted to see how digital templating went before encompassing the super-sophisticated Slabsmith. It went particularly well – and still is. This year looks likely to set another record with more than 100 units sold in Europe. After he had sold 350 laser templaters, Carl was persuaded the digital revolution had a place in stone processing and went back to Slabsmith to discuss representing the product in Europe. Slabsmith is not just software. You could not run Slabsmith on your average office PC. It requires some sophisticated hardware to cope with the no less sophisticated software and is sold as a package that includes two computers, a special camera for photographing slabs, and fixed stands for the camera and stone slabs so the inventory will be recorded in high definition, dimensionally accurate and with calibrated colours. What you see digitally really is what you get in the physical world. Slabsmith is being used in the UK but its take-up has been slow. Its potential has been more widely appreciated in the USA, where those using it find it very quickly becomes part of their everyday lives. Slabsmith uses the digital slabs it creates to provide inventory management and traceability throughout the manufacturing process. It provides 3D visual layouts of customers’ projects to use as a sales and marketing tool, and then streamlines manufacturing and facilitates targeted business decisions. A new bit of digital kit from LPE is Easy DXF, which again uses a dimensionally accurate photographic system, this time to create the DXF files required by CNC machinery from templater-fitters who are still using MDF, hardboard, Correx, or other physical templates cut on site. Many companies keep a digital templater in the factory to convert physical templates into DXF files. Easy DXF does it in the click of a camera shutter and just about anyone would be capable of using it once it is set up, so nobody is twiddling their thumbs waiting for a template to appear on a screen. Yet another product being introduced by LPE that uses high precision photography is the EagleEYE Tool Setter. This uses a high-resolution camera to capture images of your entire tool set to give you a quick and particularly accurate method of setting up each tool on your CNC for minimum wear and maximum performance every time, which can increase tool life by as much as three times. Not that everything on offer from LPE Group is high technology. The OmniCubed materials handling products already mentioned are essentially mechanical aids to manhandling stone safely around a factory and onsite. And at Marmo+Mac in Verona, LPE Group hopes to be introducing a new handling product from another American company, StonePro. 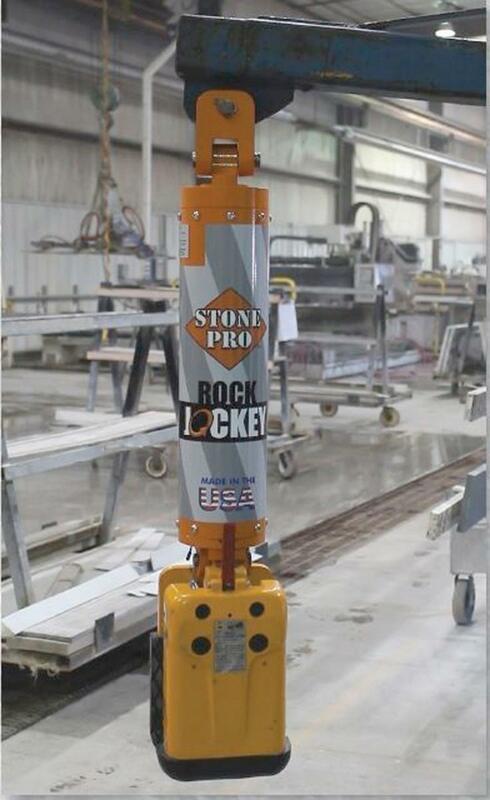 It is the Rock Jockey, a radio controlled, motorized, 360º steerable swivel that attaches between the boom on a fork lift and a slab clamp. A palm size remote control unit allows the forklift driver to swivel the slab left and right to manipulate it off a lorry or out of a storage rack and through a factory. This speeds up the process as well as making it safer by eliminating the need for a second person to guide the slab, putting them in the fall zone as well as being in front of a moving forklift. If there is any room left on the LPE stand (and the company is still trying to ascertain that) it would like to introduce another new product called the Fab King from Rye Corp. This is the antithesis of Industry 4.0, not unlike the Kolb Genius once sold in the UK by Combined Masonry Supplies, where Carl Sharkey once worked. 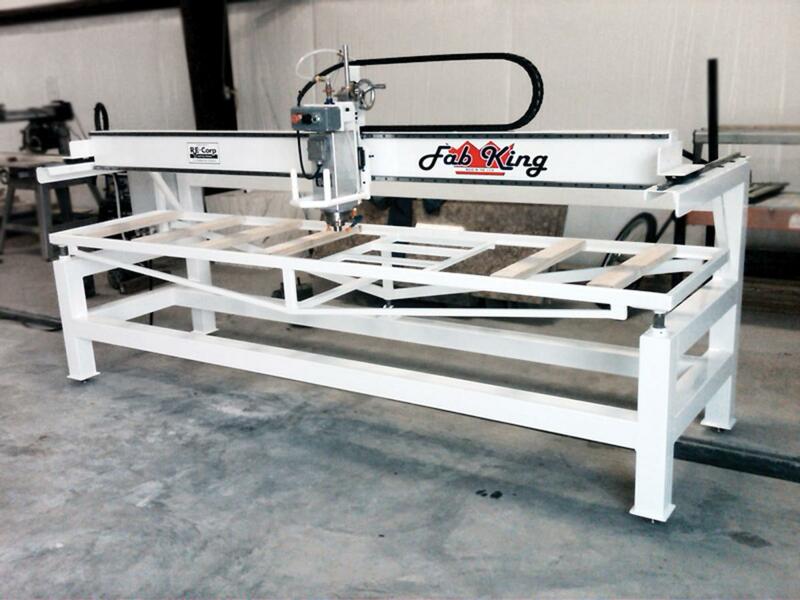 Fab King is a hand-operated machine for making worktops. It has a 3HP (2.2kW) motor mounted on a bridge for moving it left and right and backwards and forwards. It can also go up and down for drilling, which is all you need to cut out and polish the edges of a sink hole, drill tap holes and polish (or hone, perhaps) the face and edges of a worktop and splashbacks. The Fab King follows physical templates and most people could figure out how to use it without any instruction. Breton has always been happy to integrate its machines into sophisticated production lines, and some of them have been installed by the largest stone fabricators across the globe, including the UK. Now the company has introduced a sophisticated computerised management system for getting the best performance from those machines – Breton Sentinel. The picture on the left of page 16 of this report shows part of Breton’s stand in Verona last year, where it introduced Sentinel under the Industry 4.0 banner. This year Breton is in Hall 4, stand A6-A8/C6-C8/B5-C5. Sentinel is the essence of Industry 4.0, gathering and processing data from the machines on the shop floor and generating continually up-dated reports and charts about performance. Yes, the latest acronyms are jargon – OEE (Overall Equipment Effectiveness), TEEP (Total Effective Equipment Performance) – but these are also real tools for optimising cycle times, reducing idle time, planning downtime (and avoiding unplanned downtime), increasing machine and tool life... in short, producing better management through better understanding of what is happening. That translates to lower costs per unit of finished product. Sentinel includes an operator interface so the people working on the shop floor can enter the reasons for events such as downtime as it happens (perhaps a crack in a worktop being produced) providing a better understanding of what is working well and what is not. The system can be used to calculate optimum feed rates and pressures for individual products and provide operator feedback for each job. Breton last year established its own operation in Britain for sales, service and support of its machines. Its worldwide sales last year topped €200million. This year looks likely to be just as successful and among the machines sold in the UK lately are a Breton Easy Wire single wire saw to Fyfe Glenrock in Scotland; an NC 300 K40 Robocup to Granite House near Southport, Merseyside; a Combicut combined saw and waterjet and a Contourbreton NC 300 K26 contouring machine to the Solid Surface division of Oliver Exorna Group in Northern Ireland (where Breton works alongside Pat Swayne). The Oliver Exorna Group order also includes some modular solutions of the new integrated Xpress Software programming system, which can create programs for different machines from a single DXF drawing, saving time and reducing costs. Roccia Machinery is the UK agent for Italian manufacturer GMM, which last year introduced a new company logo to brighten up its image. Its big news this year is the purchase of TWJ, the Australian manufacturer of Techni waterjets. There are more than 1,000 Techni waterjets in use in 26 countries. Most of those in the UK have gone to the glass industry and for food preparation. There is only one in the British stone industry, bought by Steve Murphy of Planet Granite, near Coventry, last year (see NSS March 2017). He likes it so much he has now bought a second from Roccia. One of the selling points for Steve, just as it was for GMM, is that Techni designs and makes all the major components itself in what it calls ‘total technology’. The company makes its own pumps and writes its own software, and includes Industry 4.0 connectivity so the manufacturers can monitor the machines. Techni only makes waterjets and is particularly proud of its Quantum NXT direct servo pumps, used in a system it has patented. Direct servo pumps were developed by NASA in the Space Shuttle programme. Techni says its pumps are 60% more efficient than standard hydraulic intensifiers using 75% less water for cooling. They also use less power and oil and are particularly quiet. Their big energy saving advantage comes from providing only as much pressure as is needed when it is needed. When the waterjet is not cutting, the pump is in standby mode rather than sending power, water and money down the drain through a relief valve. Steve Murphy says his Techni uses about 180L of water an hour. He says half its running costs are accounted for by the garnet abrasive used in the cutting process, which normally costs in the region of £300-£400 a tonne. 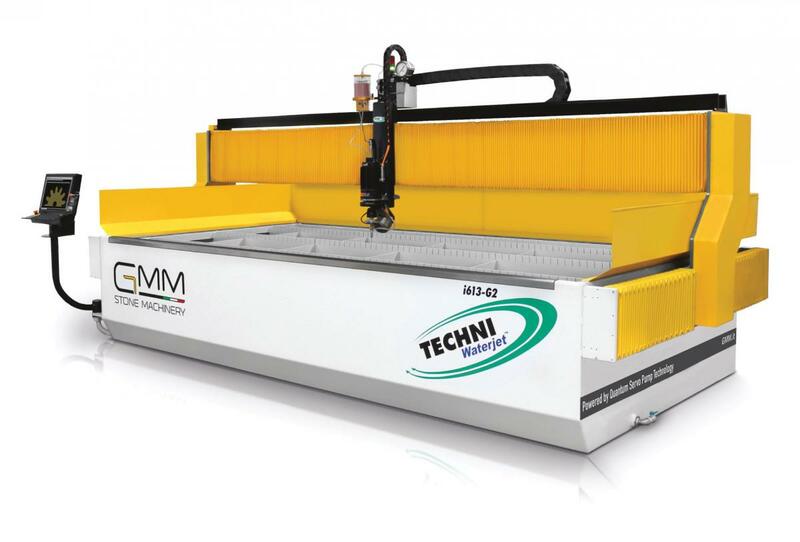 Techni also lays claim to having been one of the first to develop five axes waterjet cutting and a head that could rotate through a full 360º. It is proud, too, of its stainless steel band drive system, which it incorporated in the first waterjet it made 20 years ago and has used ever since. Most bridge drives use a ball valve but Techni describes its stainless steel band as ‘bullet proof’ for reliability. When it does eventually need changing it takes about 30 minutes and costs £150. What is now GMM TWJ will continue to deliver all the existing Techni product lines and services. And with the weight of GMM behind it, Techni will now be in a better position to market itself to the stone processing sector to give it faster international growth. Roccia also represents T&D Robotics in the UK and has sold four of the robots to one company setting up a new factory, along with a GMM waterjet, bridge saw, a CNC workcentre and materials handling equipment. Darren Bill remains convinced robots are a technology whose time has arrived and will be happy to talk to visitors about it on the T&D stand (Hall 2, C7) in Verona. It has been a good year for D Zambelis that has built on the success of the Natural Stone Show in London last year. D Zambelis is the UK representative for machinery and equipment manufacturers Omag, Terzago, Achilli, OMGM edge polishers, Dal Forno, Wires Engineering and Italmecc, all of which are exhibiting at Marmo+Mac and will be supported by the Zambelis family, who will be available on 07984 886817 and 07891 484806. D Zambelis itself has relaunched its website to make it easier for customers to use. It includes a machinery catalogue and an online e-shop, so its account customers can register to order tools and consumables online whenever it is convenient for them to do so. And Zambelis has started working with Italian toolmakers to supply electroplated tooling and customisable CNC tools. D Zambelis represents a lot of companies, and below are some of the highlights of what they will be showing in Verona. Omag (Hall 2, B4-B5) has released a monobloc version of the Area5 called the Digitale. It is a simple, intuitive, high performance machine. Once it had been announced there were enquiries about it even before the first one had been made. All but one of the first 10 have been sold. 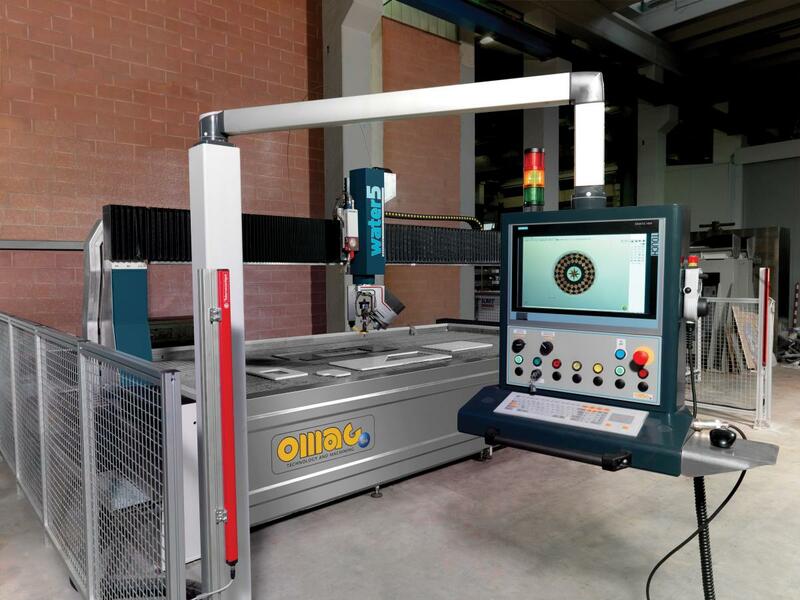 The Digitale will be one of three machines on the Omag stand in Verona. The other two are the Blade5 and its waterjet Water5. Like last year, Omag will have big display screens on its stand with video links to its factory so visitors can ask to see any of the machines in its range. Terzago (Hall 2, E9) will be showing machinery including its Easy and Forma saws. Terzagos have played their part in the D Zambelis success story this year, with four of seven already installed at Stone Firms on Portland and three going to Forest of Dean Stone Firms for its new factory now taking shape with 3m and 1.2m Omag saws, and an Omag Blade5 with a 1m blade. Terzagos have been successfully installed and commissioned at Stamford Stone and a Terzago T30 3m block cutter has also been sold in the UK. Several Terzago CUTe 625s will be installed when Terzago returns to work after the August shutdown. Achilli, Dal Forno, Italmecc and OMGM machinery has all been sold by D Zambelis this year in new and existing stone processing factories with more on order for the rest of the year. The Achilli stand at Marmo+Mac (Hall 5, C1-C2) will focus on machines to cut the new large format ceramic slabs and sintered stone surfaces. Because ceramic materials are typically thin as well as large, they are cut more effectively by stone saws that have been adapted to them. Achilli engineers have worked to make the company’s bridge saws better at cutting ceramic materials without compromising their ability to cut natural stone. 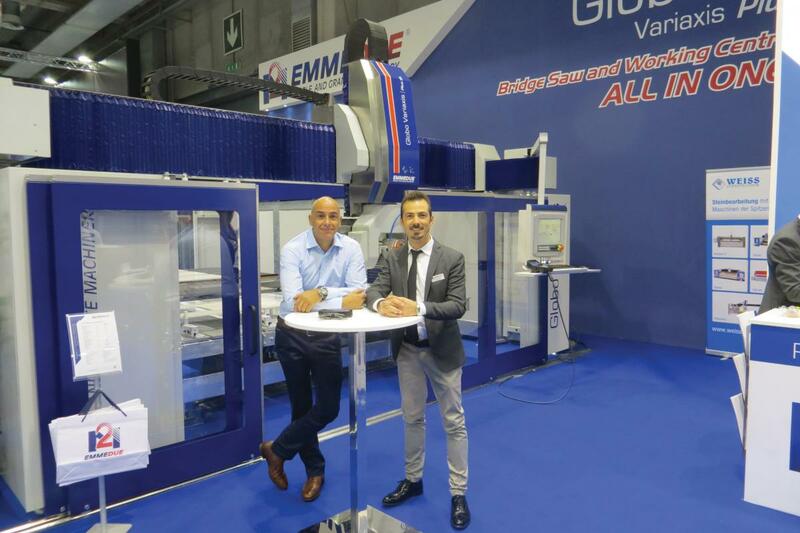 In Verona, Achilli is introducing a five axes Gold bridge saw that can also carry core drills and perform automatic cycles to cut corners and remove the tension from sintered materials. There will also be a version of the MBS TS reconfigured to cut ceramic slabs. Even the company’s slab trolly has been produced in a bigger version, which is the SC800. To complete the range dedicated to ceramics and sintered materials, there will be a customised version of the top-selling MSA mitre saw, which can cut any thickness of material thanks to the new retractable reference bar. Achilli introduces a simple, compact machine especially for making sink cut-outs rather than using a CNC workcentre. It joins the Top, which is also on the stand and is for sink cut-outs, edge profiling and polishing, hole drilling and surface re-polishing. Site saws and floor grinders and polishers complete the line-up, including a new all-in-one floor grinder and polisher that can have Cassani/Frankfurt plates, planetary heads, or single head plates mounted on it. 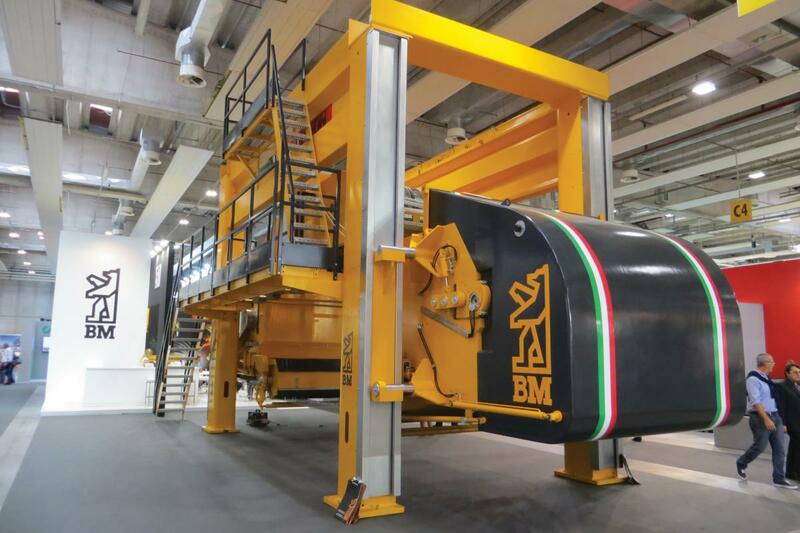 Dal Forno (Hall 2, E6) is showing a comprehensive range of vacuum lifters, column cranes, bracket cranes, hoists, gantries, clamps and other materials handling equipment and Italmecc (Hall 5, E5) will have water management and dust suppression equipment on show. Donatoni Construction Machines (Hall 2, E8) hopes to have a new website up and running by the time Marmo+Mac opens. On its stand it will have an updated version of its DM2 cross cutter with two cutting units (one fixed, one mobile), the moving head now operated by a brushless motor. It will be in the new Donatoni livery of grey and orange, rather than its familiar green and orange. Also on the stand will be an S6P cross cutter with laser selection and tilting roller bench for waste material, and the 1m wide RMG10 trimmer. D Zambelis sells wire saws by Wires Engineering. On the stand in Verona (Hall 5, E4), Wires Engineering will show its latest monowire, the F101 EVO, which has advanced software for automatic slabbing of even the largest blocks. It has been a particularly busy year for Waters Group. Ever increasing product ranges give the company more to offer customers, which has again seen an increase in sales in the year to date. Waters Group represents Cobalm (Hall 3, A30/A44-A61/A75) in the UK and says the Italian processing machinery has been selling well. The company is a pleasure to work with, says Waters Group, with a particularly quick response time when needed. “We have found Cobalm are the perfect size company to deal with on machinery,” says Waters Group Director Daniel Waters. “You can get hold of the person you require when they are needed. At the Verona show they will have their CNC machine and saws on show, and there will be some add ons and tweaks to see. On the Martini Aeroimpianti stand (Hall 5, C4) the company will have its dust extraction systems, water treatment plant and filter press. The filter press has some modifications to it and will be relaunched at the show. Konig (Hall 7, F6) will have its mobile dust extractor Rexipur on display showing customers the power you can get from it. “We have sold many units now, with customers very happy with the results achieved,” says Daniel. Waters Group also sells the American Flow waterjet cutters to the stone industry in the UK and Flow will be at Marmo+Mac (Hall 3, B42/B58) with the Mach 200. Flow says value meets performance in the Pivot+ five axes Mach 200. It is practical and flexible, using tried and tested Flow technology to give the sort of performance previously reserved for elite waterjets. The simplified, low-profile, compact cutting head with taper control will cut and mitre natural and sintered stone. And Flow’s UltraPierce vacuum assist option helps deliver reliable piercing of brittle and laminated materials, including sintered stone, marble, glass and composites. The FlowXpert software with fully integrated 3D modelling and waterjet pathing is uncomplicated, easy to use and fast. It allows you to import 2D or 3D files in most formats from clients, or to design your own from scratch. It will automatically clean up geometry issues, create the most efficient cutting path and provide a preview to check for any issues. Intermac, Donatoni Macchine and Montresor will be together for the first time in one location at Marmo+Mac this year (Hall 5, C6-C7/E6-E7). Last year, Intermac had only just bought Montresor, which makes edge polishers, and Montresor already had its own stand. This year the CNC machinery of Intermac and Donatoni will be on the same stand as the edge polishers, with the complete offering for stone processing all together under the ‘All in One’ concept of the stand, with the three brands demonstrating how they can work together to create a digital factory with 360º customer care from a single contact point. The stand features workcentres, waterjets, bridge saws, cutting centres, edge-polishers, finishing systems and collaborative robotics systems in order to provide stone companies with a synergy of completely integrated tailored solutions. Intermac will be exhibiting a new, affordable, high productivity workcentre that will ensure companies remain competitive. The Master Loader will also make its debut. This is a flexible robotic cell to optimise loading and unloading times for workcentres and waterjets. Montresor will have edge polishing solutions that clients will be able to try out and see in action. The ‘All in One’ strategy is supported by the concepts of intelligent automation and flexible integration through the latest generation of Industry 4.0 technology. Intermac’s contribution to Industry 4.0 is Sophia, an Internet of Things platform that helps make digital stone processing a reality. The new platform, previewed last year and due to be commercially ready by Marmo+Mac this month, provides real time information from machines displayed on intuitive dashboards. The information is used to monitor production, analyse how the machines are functioning, identify problems before they happen, order replacement parts, take preventative measures to avoid shut-downs and prompt routine maintenance. Completing the line-up will be Intermac’s tooling division, Diamut, showing the technology it produces daily to anticipate the needs of a constantly evolving market. The Italian Stone Theatre, a feature of Marmo+Mac where innovative stonework produced using the latest technology is displayed, will once again include work by a top designer who has used Intermac technology. The theme this year is Wellness & Hospitality, and for the third year in a row Intermac has participated in the Ristorante d’autore exhibit. Now that the summer holidays are over Stone Equipment International is looking forward to the Verona Marmo+Mec exhibition. This year, both Andy Bell, MD for National Masonry (also trading as Stone Equipment International) and Paul Hamilton, the company’s highly qualified engineer, will be in Verona. 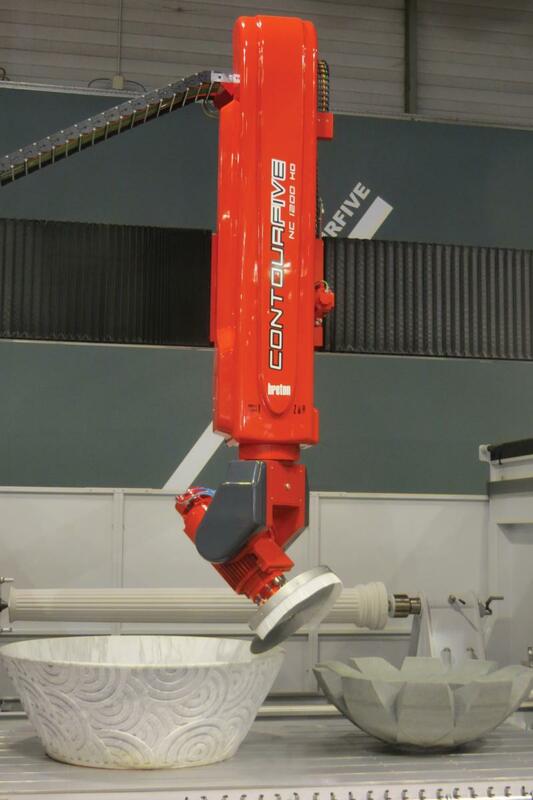 Both Marmo Meccanica and the Emmedue Division of Industrie Montantanari, represented in the UK by Stone Equipment International, will be showing their latest machines. Andy Bell (left) from Stone Equipment International will be back on the Emmedue stand at Marmo+Mac. Marmo Meccanica, which makes edge polishers, will be showing the new LCR, which has generated a lot of orders and a great deal of interest in the UK (as reported in NSS in June) and in America. With its unique cam system it polishes pencil rounds with ease and Stone Equipment International clients have reported it can polish pencil rounds in half the time it takes on some edge polishers. Marmo Meccanica will also be showing the LCV, LCG, LTX Combi and LCT edge polishers, plus its HTO-R2 bridge saw. Stefano Amagliani, President of Marmo Meccanica, Rita Alessandroni, the International Sales Manager, and Andrea Ronconi and Antonio Cimarelli, engineers, will be on the company’s stand (Hall 3, B74/B88-B67-B85). 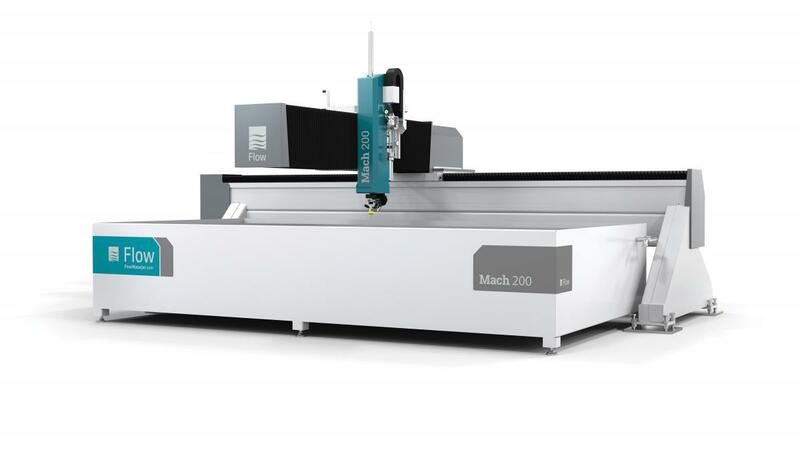 The Emmedue Division of International Montanari (Hall 3, C31/C43 and C72/C84) will be showing four of its most popular machines – Astra 5-Axis Plus and Discovery 5-Axis Plus saws; Contor 360 4-Axis and the Globo Variaxis workcentres. UK sales of the Discovery 5-Axis Plus bridge saws have been strong, with three sold in the Worcestershire area, within a 20 mile radius, this year alone. The easy-to-use interface means that complex tasks can be programmed by operators with any level of experience. The Discovery 5-Axis Plus has a wide range of options so it can be tailored to each customer’s needs. On the Emmedue stand is Christian Montanari, General Manager, and Vito Oliva and Simone Terenzi, Area Managers, along with four of their skilled technicians. Andy Bell and Paul Hamilton look forward to seeing you at the show, although Andy points out that it can be quite hectic, so if you email [email protected] you can reserve a time to meet on the stand of the company you are interested in. Ferrari & Cigarini is a machinery company that started making ceramic tile cutters in 1988 and has followed ceramics into the stone processing arena, including exhibiting at the Natural Stone Show in London last year to reach markets in the UK and Ireland. It is still looking to supply this market. It has expanded its product range with machines specifically for the stone industry, including edge profilers, machines for making mosaics, surface texturing machines, machines for calibrating and bevelling, saws and more. A good selection will be on show in Verona (Hall 5, F3). On Point Engineering, set up as a machinery supplier in the UK by Bruno Machado last year, now represents French stone machinery manufacturer Thibaut. Bruno Machado has been in the stone industry for many years and through On Point Engineering is now the contact point for all Thibaut customers in the UK, dealing with sales, parts and service. On Point entered the market offering machinery installation and servicing and selling the German-made ECS Eich water treatment plant (Rossi Stone Surfaces in London and Robertson Granite’s new factory in Aberdeen have Eich equipment and Eich will be at Marmo+Mac (Hall 5, B3). On Point employs two technicians, who have also been in the stone industry for many years. Thibaut is a well-established name in stone processing in the UK with a lot of machinery in stone processing workshops, so obtaining the agency was a coup for On Point Engineering, giving it a significant status among the machinery suppliers of the British Isles. Bruno Machado is happy enough to have sold 13 Thibaut products since taking on the agency at the beginning of the year. They include a TC 600 bridge saw and T812 and 818 workcentres. (Hall 4, F2-F3,G1-G3), where the company will show seven machines for processing all types of natural and agglomerated materials. New this year is the T952, a powerful, six axes multifunction machine from what Thibaut calls the All-In-One range. This All-In-One machining centre saws, mills, routes and polishes. 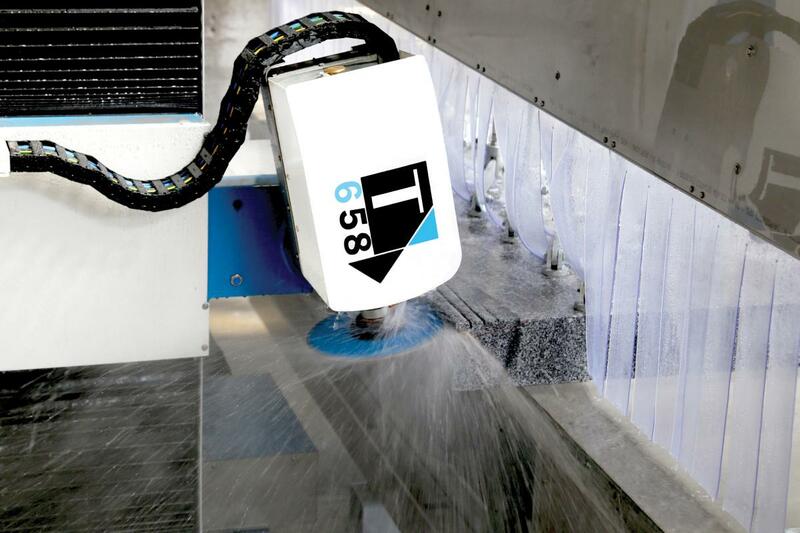 It can perform straight cuts, inclined cuts, flat polishing, 3D shaping, drilling, edge polishing and more, with the new six axes head developed by Thibaut offering sturdiness and accuracy. It comes with the latest user-friendly and ergonomic ‘Pilot’ interface for efficiency and speed. Also on the stand is the T818 M4 Tops, a three or four axes machining centre with two transfer tables for continuous production. Then there’s the T658, a multipurpose edge profiling and polishing centre for straight or profiled edges with automatic tool changing. Conceived largely for memorial production, it can also be used for countertops and building stone applications. It is easy to program (and, therefore, use) and its 21-space tool magazine means it can get on with a variety of jobs without supervision. The TC600 is an up-to-five axes CNC sawing and milling monobloc that is approved for ceramics. 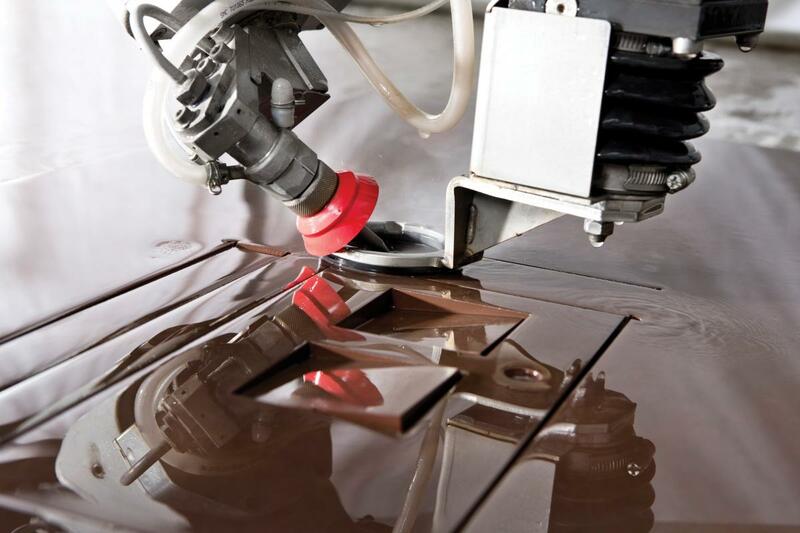 It can cut materials up to 200mm thick and profile workpieces of any shape. The 360º disc rotation means it does not need a turning table, so takes up less room. The TC1350 V2 is a multipurpose sawing and profiling centre with a moveable beam for high capacity with minimum height. It cuts materials up to 500mm thick, offering plenty of power and torque from its 44.4kW spindle at variable speeds up to 6000rpm. Automatic tool change means the machine can be set up to go from drilling to profiling to 3D shaping. There will be a T108S, a standard in the world of manual multifunction Jenny Linds and still popular even in the age of the fourth industrial revolution. Waterjets are popular additions to UK stone factories and Thibaut will once again be showing its version, the TWJ 4020, available with three or five axes and with a table of 3.3m x 1.7m or 4m x 2m. Octopod suction pads will be on show again. They have no wires or pipes, so are simple to position and are not susceptible to freezing in winter. Octopods were introduced in 2015 and, as is so often the case with new ideas, there was a certain resistance to them initially. However, the idea is catching on and Bruno Machado says they have been a good seller in the UK this year. The Thibaut stand will also have a display of TSB tools and accessories for working any of the increasing range of materials used these days by stone processors. The machinery New Stone Age sells includes BM, which has some of the largest multiwire stone saws in its extensive range. At Marmo+Mac this year (Hall 2, C5-D5) BM is using Virtual Reality to display its latest multiwire saw, the Kodiak Evolution, that carries up to 80 wires. This machine uses an innovative three point drive system with large drive and idle drums to reduce stress on the thin (just 5.3mm) wires. There is Industry 4.0 technology linking the saw to the manufacturer, allowing BM to monitor it and diagnose any faults remotely. It might be a while before an 80-wire saw is seen in a British quarry but New Stone Age has supplied plenty of BM monoblades to the UK market this year. They include the Fast model, which has a new type of powered rotating table with hydraulic corner locks for stability. One customer has ordered two Automatic Block Trolleys, positioned one after the other so the machine can work through the night. Another brand sold by New Stone Age is BV-Tech, which continues to provide both standard and bespoke machinery to the UK. Recently BV-Tech was asked to design a processing line to meet specific requirements for low running costs, especially in terms of manpower requirements, but high volume for producing stone setts. The line it produced has an RBV/1500 four-headed stripping saw, with each head holding up to three blades. This machine is on the BV-Tech stand (Hall 2, B3) in Verona. The line is fed with sawn-two-sides slabs up to 1500mm wide and 100mm thick. The operator of the stripping saw can decide which of the four independent units are used and regulate the distance between each head. Once the slab has been cut into strips, the strips pass through to an IBV/1500 automatic heading machine, again with four blades, to be cut to the lengths that have been programmed in. These can be adjusted as the work continues for the best yield from each strip. The same customer has also installed a BV-Tech IBV/600 Automatic Heading Machine at a second factory, again to produce stone setts. There, New Stone Age supplied a second Cortan flame texturing and bush hammering machine to apply the finishes to the stone setts. If you are looking for water management, New Stone Age sells Omec systems, as it has for more than 15 years. At Marmo+Mac, Omec (Hall 2, E10) is showing a new, small water treatment system, although the latest system being supplied by New Stone Age deals with up to 3,000L/min. It is replacing an older system, using the existing infrastructure and foundations to minimise down-time during the change-over. Accurite has represented Italian machine manufacturer Denver for many years, and has continued to do so even while it has been gradually expanding its own brand range of machinery. At Marmo+Mac, Mark will be on the Denver stand (Hall 3 B27/B47-C24/C48) to talk to visitors from Britain and Ireland. He will not have a stand of his own to show his Accurite machines, which now include primary saws running on gantry rails for multiple block sawing, bridge saws, wire saws, jenny linds, a mitre saw, edge polishers, miller-routers, cross cut saws, a calibrator… even a mini crusher. 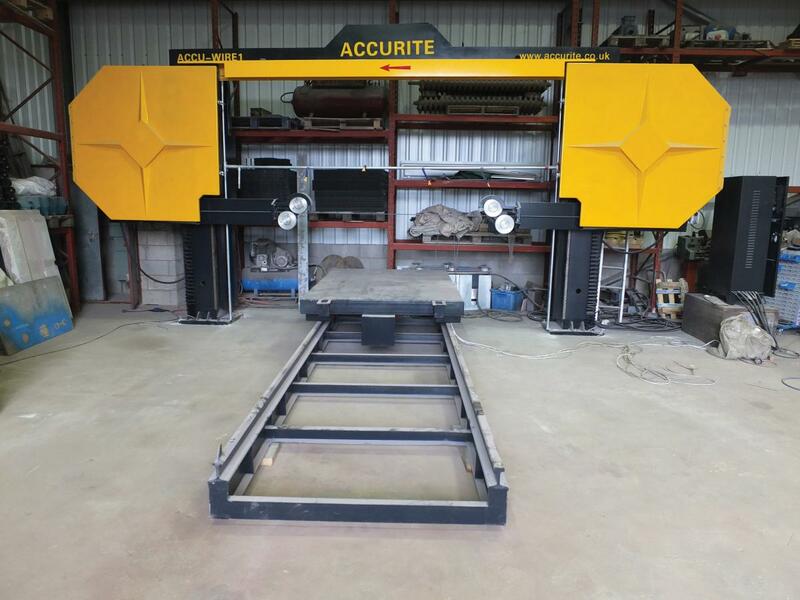 Accurite started importing and own-branding machinery because Mark thought saws coming into the UK, mostly from Italy, were too complicated and too expensive for a lot of British stone companies. He sourced them in China because of the low prices, although he now also own-brands edge polishers from Italy. He has invested in improving and expanding his own workshops, where he refurbishes used machinery as well as assembling the new machines. He employs five fitters/engineers. Accurite encompasses aspects of Industry 4.0, using the internet for remote diagnosis of customers’ machines. It uses Team Viewer, giving customers a code to enter when they buy a machine so the machine can be operated remotely from Accurite’s premises, and Face Time so the customer can use their smartphone or tablet to show the Accurite engineers the machine. Mark says the information gathered still has to be interpreted and “you have to be careful not to jump to conclusions” but “99 times out of 100 you at least know what the problem is”. At Marmo+Mac, Denver’s main emphasis this year is on new software on their machines to help with trouble-free processing of the latest generation of man-made materials – ceramics and ultradense surfaces such as Dekton and Lapitec. The new Agua water-jet cutter will be on show with the more user friendly software. Also on the stand will be the Denver Vision face polishing / texturing / bush-hammering machine, which has been re-modelled to give it a larger, stronger frame. Again, it has new software. Mark Brownlee says the Denver Vision has grown in popularity over the past few months along with a customer preference for textured finishes. Also on the Denver stand will be the Quota 3350 CNC miller-router and a range of four and five axes CNC saws, some that can accept a routing attachment. Britain’s only manufacturer of stone processing bridge saws and croppers, Wells Wellcut, will not be exhibiting in Verona and never has. It says it has its work cut out keeping up with demand in the UK. The company has a reputation for making reliable workhorses designed to work in arduous conditions that many quarries and traditional masonry companies rely on. The saws can be supplied to run on gantry rails to be left cutting several blocks. With 9m travel on the bridge and a 9m beam, the Wellcut 3m Gantry Autosaw has a programmable logic controller (PLC) for making up to 40 programmed cuts. The Wells Bridge saw range starts from a 400mm diameter blade and goes up to the 3m version. All have recirculating water tanks and the only civil engineering needed for their installation is a sufficiently robust hard standing. As well as its own saws, Wells also works in conjunction with a similar manufacturer in Portugal to supply a wire saw, which it sells under the Wells name. The exchange rate has not helped with sales of the Portuguese products and the latest one sold was to Cassidy Brothers in Ireland, where the exchange rate does not arise. It was the bothers’ second. Cassidy Brothers use the saws for cutting the quartzite they extract. In 2015 they were contracted by Willerby Landscapes to manufacturer benches for the Here East Project in the regenerated Olympic Village in Stratford London. Wells saws and croppers have always been good value and have looked even more competitive as the falling value of Sterling has increased the price of imported saws sold in the UK. Wells Wellcut says it has enjoyed two of the busiest years it has ever known since the referendum in 2016. This year’s top performers are the Wells hydraulic guillotines, primarily used for the production of dressed building stone, although they are also used to cut kerb stones, block paving and sawn stone. “We have sold more croppers in the past two years than in the previous 10,” says John Wells, a Director of Wells Wellcut along with his son, Luke. Like the saws, the AutoCroppers have relatively simple electronics so there is little to go wrong. They have a solid slatted conveyor, like a Caterpillar track, which is exceptionally strong, operated by a PLC with a magic eye and solenoid valve pitted with a measurement device. The cropper measures the stone accurately and self feeds in and out of the guillotine. The Mk7 has a 20HP high output electric hydraulic pump fitted as standard, giving it the capacity to split approximately 400m of stone a day. As well as the conveyors Wells Wellcut supplies with the croppers, the machines are often also sold alongside the Wells tumblers that take the hard edges off stone for a natural look. Wells has always been happy to take its machines back in part exchange when customers are buying replacements because there is a ready market for them once they have been refurbished. However, the supply is drying up, with customers now tending to add to their capacity rather than replace older machines. To help try to keep up with demand for its machines, Wells last year built a new factory, which John says is “sort of open” although a road to it has yet to be constructed. Some of the 10 people employed by the company are working in the new unit. SMC Stone Machinery sells the Italian CMS Brembana CNC range in the UK and Bovone edge polishers and tools. 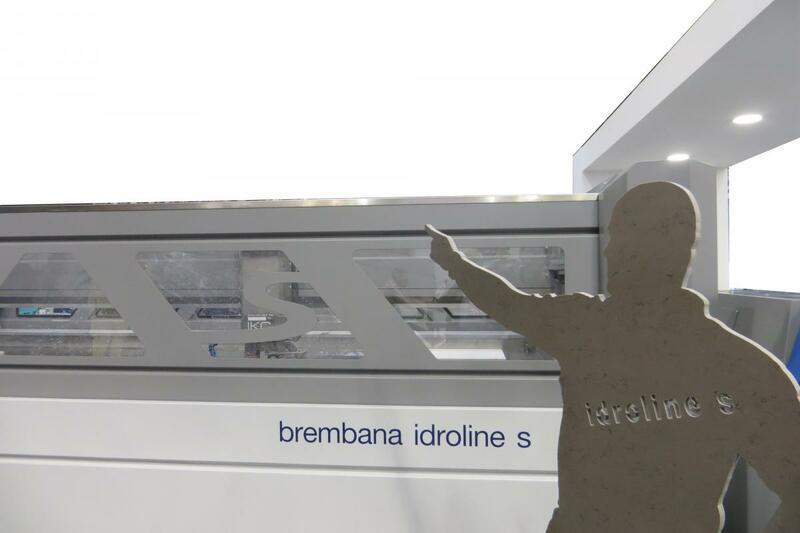 At Marmo+Mac, CMS Brembana (Hall 3, B47/B65-C50/C70) will be showing its Easyline three axes waterjet that has a cut travel of up to 2m x 4m. It will be alongside the Maxima, Speed 13 and Sprint workcentres. 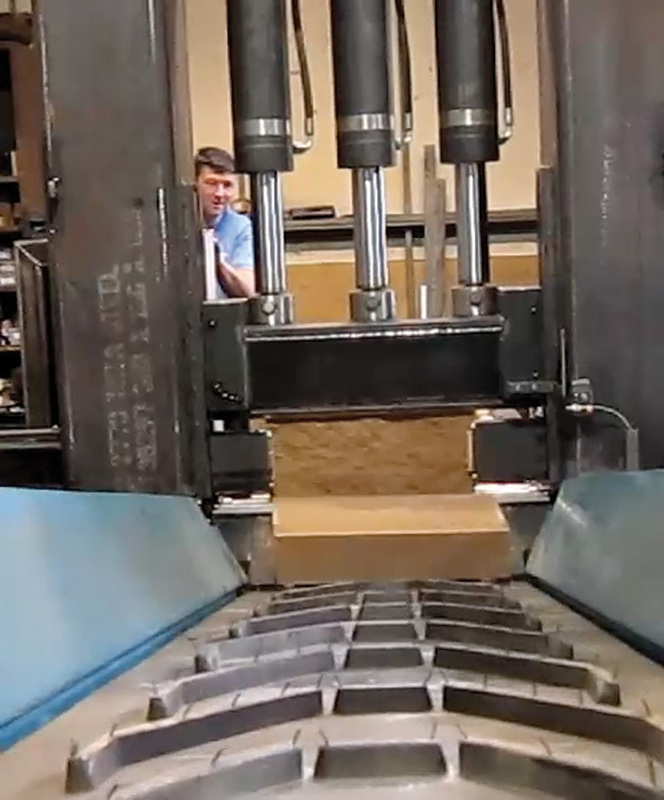 Maxima can have five or six axes for working with precision quickly, whether processing natural or engineered stone. Features include: a bed of perforated duralumin for perfect flatness; a monobloc electro-welded ribbed base; two, zero clearance gearboxes on the B and C axes that are extremely precise and do not require any maintenance; a Z-axis stroke up to 2m. The Speed 13 can perform quickly and accurately any type of edge profile, milling, drilling, flaring, bas-reliefs and inscriptions. It is the most compact of the CMS workcentres but versatile enough for both small workshops and large factories. The Sprint is used for producing floors, wall linings, stairs, frames, kitchen and bathroom worktops and furniture surfaces. The Bovone edge polishers will not be on show in Verona, although Bovone tooling, which SMC Stone Machinery also sells, will be. The Dazzini S900T wire saw sold in the UK by Pat Sharkey Engineering has once again been popular this year among quarry operators, with both granite and slate quarries investing in them. If you want to see wire saws like it, along with quarry chain saws, hydro bags and pumps at Marmo+Mac in Verona you just have to visit the Dazzini Macchine stand (Hall 5, B2) where Pat and Neil Sharkey will be happy to join you to explain the benefits of the Dazzini machinery. Dazzini is based in Carrara, home of the famous Italian marble, where it has more than 200 of its machines working in the quarries. It has many others in quarries all over the world, and Ian Skinner, the Quarry Manager at DeLank granite quarry in Cornwall is happy to explain why. DeLank granite has been cut from the face using wire saws for many years, but Ian has been impressed by the increase in productivity achieved by his Dazzini. It used to take two days to cut through the dense Cornish granite but that has been reduced to six hours. This machine is also successfully being used by Burlington Stone in Cumbria. 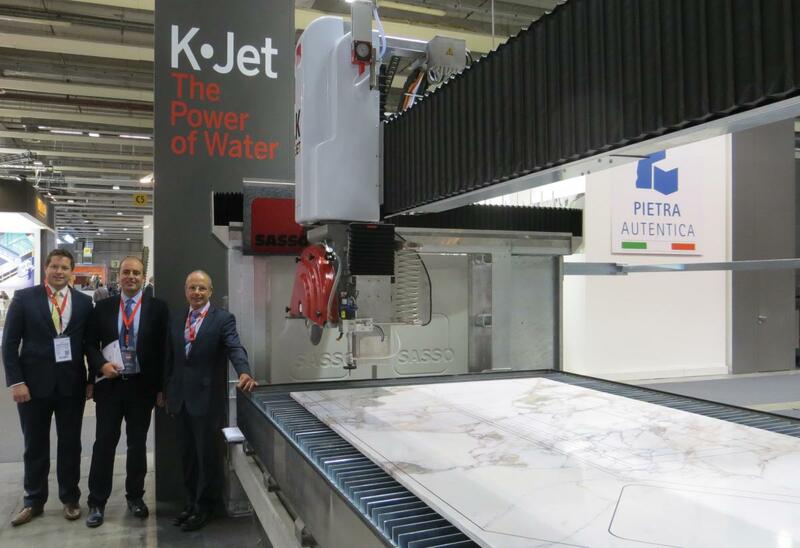 Neil Sharkey (left) and Pat Sharkey (right) with Sasso Vice-President Mario Leali next to the new Sasso K-Jet combined waterjet and bridge saw introduced at Marmo+Mac last year. Another of the companies Pat Sharkey Engineering will be supporting in Verona is Sassomeccanica, which makes CNC machines that incorporate FST or Alphacam software, bridge saws, edge polishing machines and ashlar lines. Sasso has seen sales grow so much in recent years that it has relocated to new, larger premises in its home town of San Benedetto, reflected by an even larger stand in Verona this time (Hall 2, C2-D2-D3). In the UK, the K600 CNC has proved popular in the kitchen worktop and interiors sector, while more traditional masonry companies prefer the larger K900 CNC saw. Near to Sasso will be another of the companies Pat Sharkey Engineering represents, the Sigma Group (Hall 2, F8), which is a local Verona maker of dust suppression and water treatment systems (there will be more about that in the November issue of this magazine). In Hall 5, F2-G1-G2, you will be able to see the Nuova Mondial Mec bench saws, floor polishing machines, monobloc and mitre saws that Pat Sharkey Engineering sells. The Manta LX bench saw is the UK’s most popular choice. It can be manually operated or fitted with motorised height and blade travel. A lightweight, aluminium bench saw for easy, one-man transportation to site is also popular. All the saws have a water reservoir in the main structure and their own pump, making them self-contained. Pat Sharkey’s longest standing agency is for the German saw-maker Spielvogel. Spielvogel is not exhibiting in Verona, but continues to produce the solid, robust saws and jenny linds that have earned it a reputation for quality machinery over many years . Bavelloni tends to concentrate on the glass industry and the machines are distributed in the UK by Glass Machinery Solutions. It will not exhibit at Marmo+Mac. Nevertheless, the stone versions of its robust, fast CNC workcentres are favoured by some in the stone industry. The Stone NRG330 and NRG420 are its stone sector flagships, available in three, four and five axes versions. A novel touch is an automatic door that opens by sliding up, the idea being to help reduce loading and unloading times. Set-up time is also reduced by the patented automatic system for positioning suction cups and centring devices. And more diamond tools can be stacked on to each cone, reducing the number of tool changes needed for some materials. And a tool pre-setting device on the machine automatically measures the radius and height of tools for efficient and accurate use and minimum tool wear. One of the reasons these CNCs can machine so quickly is the patented Powerjet tool cooling system, which requires no manual adjustment. The Italians are also proud of having developed an improved electrospindle entirely in-house, further enhancing performance, along with the responsive direct drive digital axis controls. Bavelloni traditionally oversizes guide rails, racks, ball screws and so on for stability, reliability and long life, as well as speed. Drilling, milling, edging and polishing operations are accurately and quickly performed by these high-end workcentres.